In a galaxy not so far, far away – a.k.a. 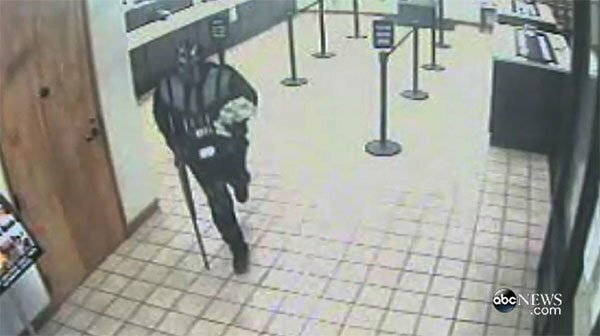 this one - a man decided to rob a bank wearing a Darth Vader mask while carrying a large gun. The assailant made sure that his mask was matched with further black and dark clothing as he committed the crime in Pineville, North Carolina. NBC has confirmed that the incident unfolded at around 11:45am on Monday morning, and authorities and police have insisted that, despite the mask that was worn the case, the whole situation is very serious - especially since the individual responsible is still at large. The suspect, who is believed to be a black male and 5 foot 5 inches tall, stormed into the State Employee’s Federal Credit Union in Pineville while the building was full of customers and employees. The Darth Vader criminal had a long-rifle and demanded that cash was handed over to him. The teller immediately followed his orders, and he left instantly. 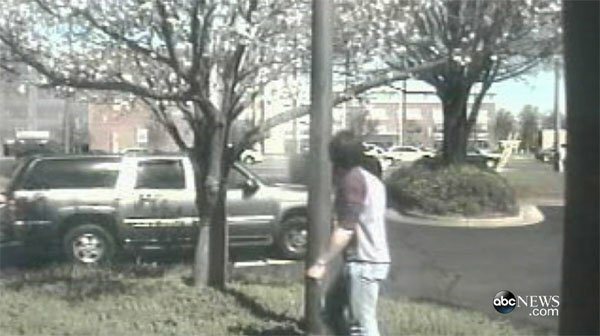 No one was hurt in the incident, but it’s been reported by local news WSOC that the criminal made way with thousands of dollars. A terrifying still of the robber in the middle of his dastardly deed can be seen below, from an ABC News report, and it will immediately make you realize just how serious the situation was. Another picture of the thief exiting the bank after the incident has been released, which will give you a full look at his stature and frame. This isn’t the first time that a criminal has decided to use an iconic movie character mask as a disguise. Last year a man in Lewiston-Auburn, Maine, donned a Spider-Man camouflage to rob a store. It’s also worth pointing out that Darth Vader’s reputation has actually been dragged through the mud before in a similar scenario as well. 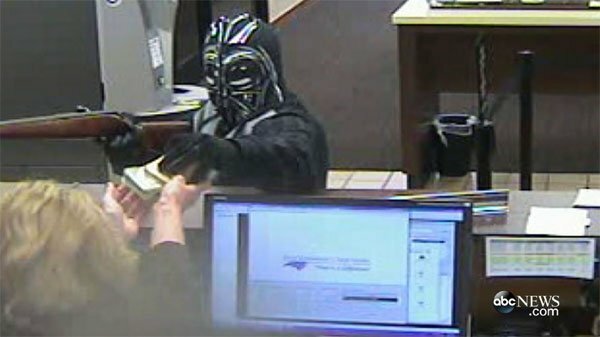 In 2012 a trend-setting bandit wore a Darth Vader mask to rob a bank in Ohio, before he then fled on a bike. I can only imagine that his TIE fighter was in the shop. To see more security cam images from the robbery, head over to Page Two to watch the ABC News report about the case.